‘Seva hi Paramo Dharmah’, ‘the selfless service is the highest form of any religion’. These words were said by His Holiness Acharya Shrivatsa Goswami, Founding Trustee and Member Secretary of Friends of Vrindavan during his felicitation ceremony jointly organised by Friends of Vrindavan and Vraj-Rasik Bhakta Mandali in the auditorium of Shri Manav Seva Sangh. The felicitation event began with the worshipping Shri Radha Raman Lal Ji and Vrinda Devi by His Holiness Swami Suprakashananda Ji, Secretary of the Rama Krishna Mission, Vrindavan branch. Swami Ji along with many other Brajwasi intellectuals, priests and devotees praised Maharaj ji for his efforts to spread and enhance the glory the Sanatan (Hindu) Dharma at the world body of the United Nations. Swami ji honoured Goswami ji by presenting a shawl to him. He was followed by Shri Ram Narayan Brajwasi, Senior Vice President of the Brajwasi Panda Sabha and other saints and brajwasis who offered garlands, shawls and dupattas. We are proud of Goswami ji representing Hinduism at the conference of the United Nations. It is pride for the people of Vrindavan as Maharaj ji is a Sevait of Shri Radha Raman Temple, said Shri Madan Bihari Das Baba, a prominent saint from the Tatiasthan. Prof. K.M. Agarwal said that Maharaj ji was also invited by the Pope Benedict XVII in Vatican. His participation in these international forums is really a matter of joy for the residents of Vrindavan. Shri Sushil Chandra Sharma and Dr. Vinod Banerjee all noted educationist of Vrindavan said that Maharaj ji’s efforts on Vraja conservation should be the example for the future generation of Vrindavan. 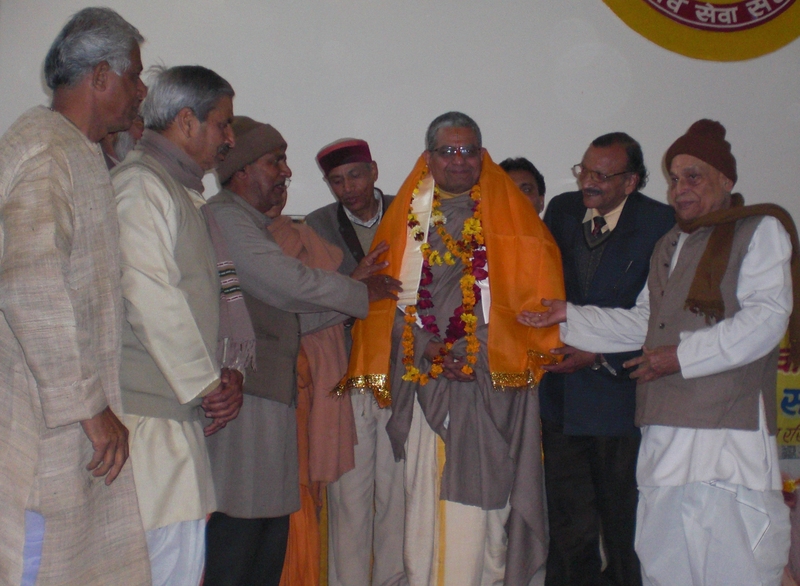 Shri Jagadananda Dasa, editor of Vrindavan Today; Shri Udayan Sharma, a well known social activist and many others also addressed the gathering praising Shri Goswami ji. Maharaj ji said that the service to the Lord’s creation is the best form of religion. He humbly dedicated this felicitation ceremony to Govind , Gopal and Shri Dham Vrindavan. He said that Govind mero hai’ and ‘Gopal Mero hai’. He said that it was not actually his felicitation, but it was the felicitation of Shri Govind , Gopal along with Shri Vrindavan Dham and the brajwasis. He said that whatever he has done for the society so far, it could have been possible only with the grace of Shri Dham Vrindavan and the love of all brajwasi friends. Maharaj ji encouraged all the temples to begin some charity at their doorsteps so that Vrindavan becomes a temple of service. When asked by the audience on what did he suggest at the forum of U.N.O., Maharaj ji replied that he suggested forming United Nation’s Religious Council, which could encourage the harmony among all the religions. The function was anchored by Dr. Chandra Prakash Sharma who said that Shrivatsa Ji is a gem in the crown of Yugal Sarkar. The function was presided by Shri Advaita Chaitanya Brahmachari, President of Shri Manav Seva Sangh, who said that it will be a privilege for Manav Seva Sangh to publish articles on Maharaj ji’s discourses and lectures.